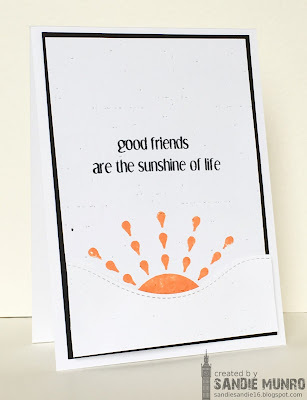 I have used the Sunbeams stamp set from CAS-ual Fridays-I actually wanted to enter it into the 'Friendship' challenge there but am a day late! I just stamped the sunbeams and then die cut a stitched die, popped this up on foam tape so it looks like the sun is rising! 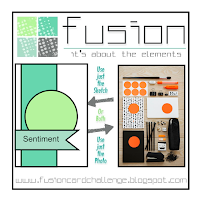 I used black and orange for the Fusion Challenge. And took the sunshine inspiration from the beach scene at Calling All Sistahs-an encouragement card for my friend to remind her how she brings sunshine into my life. Your card is just beautiful...so perfect! What a great way to use that CAS-ual Fridays stamp Sandie - I love how you've placed it behind the stitched die cut. It's amazing how the stitching gives just a bit of detail on a CAS card! Thanks for playing along at Fusion! Love, love, love how this looks...the sun rising is gorgeous! 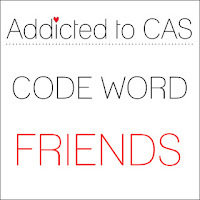 I love this CAS beauty, Sandie! Love the way you have created a sunrise on your card! Thank you for playing along with the Calling All Sistahs Encouragement challenge. great card, love the design. Thanks for playing along with the CAS Encouragement challenge.